In 2018, three month-long cruises will visit different parts of the Arctic to collect samples. The investigators will once again be on-board the RRS James Clark Ross. The first cruise in May 2018 (JR17005), led by Prof David Pond (DIAPOD), will cross the Fram Strait region, from the west coast of Svalbard to the east coast of Greenland (Fig. 1). The cruise will also collect samples for the ARISE project. Read the press release for departure of cruise JR17005 here. Several of the ARISE scientists have a blog called “Life as an Arctic Scientist” to record their experiences, the science they are carrying out, as well as answering questions posted school children. Access the blog here. Figure 1: The two main sampling areas to be visited by the DIAPOD cruise in May 2018. The second cruise (JR17006) will be led by Prof Finlo Cottier (Arctic PRIZE). 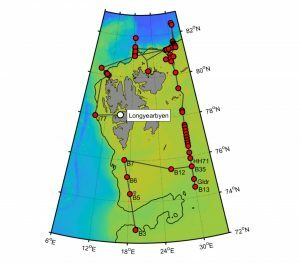 The sampling locations during the cruise were dictated by the location of the ice edge during June 2018. The final cruise track is shown in the figure below. Figure 3: Overview of the cruise track and all station locations, commencing in Longyearbyen and ending in Tromsø, Northern Norway. Read the press release for departure of cruise JR17006 here. A quartet from the Arctic PRIZE project are maintaining a blog during the June 2018 cruise (JR17006) to the Barents Sea. Judith Braun, Jamie Rodgers, Martin Foley and Andrew Orkney, all PhD students, will post updates on their activities and the science, as well as answering questions you may have about their work. Read their blog here “New Arctic” blog (https://arcticocean.blog/). Read the JR17006 Cruise Report here (downloadable pdf file from BODC website). The final cruise of 2018 (JR17007) takes place in July. This will be led by Prof Martin Solan, ChAOS project. The cruise will revisit the areas in the Barents Sea that they covered during the CAO 2017 cruise (Fig. 2). Read the press release for departure of cruise JR17007 here. View the 5 minute video clip of the ChAOS cruise here. Figure 2: Planned sampling areas for the ChAOS cruise in July 2018.